Valentine symbols have changed since courtly love flourished in the High Middle Ages. By the late nineteenth century Valentine cards were popular. Today it is difficult to escape Valentine's kitsch. Remembering the tradition of expressing love through love notes FotoInsight puts the personal note back into Valentine. Cambridge, 21 Jan 2009. 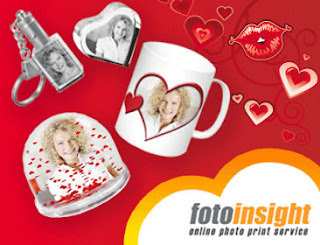 -- FotoInsight, a leading independent digital photo service, is expanding its range of Valentine's photo gifts. “Love is a special feeling and it must be expressed in an extraordinary way, Valentine's Day is the perfect occasion. Valentine's Day gifts are important to make your day memorable” states Catalina Martinez, Head of Communication at FotoInsight Ltd.
• Love Crystallised: FotoInsight adds to its selection of photo gifts designed to display and preserve cherished photographs. Valentine’s Day photo gift ideas include crystal heart with a 3D laser engraved photograph, picture frames, crystal key rings, pen holder glass block with a laser engraved photograph. Special about the crystal key ring is an LED light to illuminate the engraved image. • Cups full of cheers: The FotoInsight Designer software provides templates (for example in heart shape) to print photos onto mugs. Publishing permission granted; 534 words. Copy or link appreciated.